The G&S Society of South Australia has a remarkable history of producing huge musicals in volunteer theatre and Guys And Dolls, one of America’s most beloved and acclaimed musicals, is their latest endeavour. The excellent script, fun characters and terrific songs in this show, provide wonderful material to the talented and hard-working cast, under the capable direction of Karen Sheldon with choreography by Kerry Hauber, and musical direction by Martin Cheney. It has colourful characters, great songs and plenty of laughs. Based on the 1930s Damon Runyon stories about small-time gangsters and gamblers in New York, the plot revolves around two slightly dodgy ‘guys’, Nathan Detroit and Sky Masterson, and the ‘dolls’ in their lives. Nathan, played by the very entertaining all-rounder Brendan Cooney, has been engaged to performer Miss Adelaide (the gorgeous Jeri Williams) for 14 years, not wanting to rush into anything! Sky Masterson (Jason Bensen) on the other hand, prides himself on being able to get any ‘doll’ he chooses. When Nathan bets Sky he can’t get Sister Sarah, (Sophia Bubner) the local soul-saver, to go to Havana with him, Sky sets about seducing the unsuspecting evangelist, and the famous story unfolds. Sophia Bubner captured the sweet and enthusiastic character of Sister Sarah very convincingly throughout the show. Although she struggled with some of the high notes in I’ll Know and I’ve Never Been In Love Before, her performance was consistently good. Jason Bensen, looking remarkably like a young Jimmy Stewart, is an excellent singer and had one of the hit songs of the show with Luck Be A Lady Tonight. Although he didn’t really come across as a streetwise, passionate gambler from the seedier side of life but more of a Mr. Nice Guy, he is obviously very at home on the stage and pleasant to watch. Jeri Williams was a show stealer. A wonderful singer, with heaps of energy, she totally embodied the very fun character of Miss Adelaide no matter what she was doing, with some great numbers including Bushel And A Peck and Take Back Your Mink. Sue Me, the duet with Brendan Cooney, was particularly charming. Other great songs include the terrific three-part Fugue For Tinhorns from Nicely Nicely Johnson, Benny Southstreet and Rusty Charlie played with relish and great comedy timing by Nicholas Bishop, Raymond Cullen and Nathan Quadrio respectively, and Sit Down, You’re Rocking The Boat led by Nic Bishop with the entire cast was wonderful. This show is a credit to the commitment of all those involved and will get better and better each night as the cast hit their straps, and can really drop into their characters, in every dance routine, song and scene. A joy for musical theatre lovers. Guys And Dolls continues at Arts Theatre, at various times, until Sat 10 Oct.
Book at gandssa.com.au. Click HERE to purchase your tickets. Arts Theatre, Fri 2 Oct The G&S Society of South Australia has a remarkable history of producing huge musicals in volunteer theatre and Guys And Dolls, one of America’s most beloved and acclaimed musicals, is their latest endeavour. The excellent script, fun characters and terrific songs in this show, provide wonderful material to the talented and hard-working cast, under the capable direction of Karen Sheldon with choreography by Kerry Hauber, and musical direction by Martin Cheney. It has colourful characters, great songs and plenty of laughs. Based on the 1930s Damon Runyon stories about small-time gangsters and gamblers in New York, the plot revolves around two slightly dodgy ‘guys’, Nathan Detroit and Sky Masterson, and the ‘dolls’ in their lives. Nathan, played by the very entertaining all-rounder Brendan Cooney, has been engaged to performer Miss Adelaide (the gorgeous Jeri Williams) for 14 years, not wanting to rush into anything! Sky Masterson (Jason Bensen) on the other hand, prides himself on being able to get any ‘doll’ he chooses. When Nathan bets Sky he can’t get Sister Sarah, (Sophia Bubner) the local soul-saver, to go to Havana with him, Sky sets about seducing the unsuspecting evangelist, and the famous story unfolds. Sophia Bubner captured the sweet and enthusiastic character of Sister Sarah very convincingly throughout the show. Although she struggled with some of the high notes in I’ll Know and I’ve Never Been In Love Before, her performance was consistently good. Jason Bensen, looking remarkably like a young Jimmy Stewart, is an excellent singer and had one of the hit songs of the show with Luck Be A Lady Tonight. Although he didn’t really come across as a streetwise, passionate gambler from the seedier side of life but more of a Mr. Nice Guy, he is obviously very at home on the stage and pleasant to watch. Jeri Williams was a show stealer. A wonderful singer, with heaps of energy, she totally embodied the very fun character of Miss Adelaide no matter what she was doing, with some great numbers including Bushel And A Peck and Take Back Your Mink. Sue Me, the duet with Brendan Cooney, was particularly charming. Other great songs include the terrific three-part Fugue For Tinhorns from Nicely Nicely Johnson, Benny Southstreet and Rusty Charlie played with relish and great comedy timing by Nicholas Bishop, Raymond Cullen and Nathan Quadrio respectively, and Sit Down, You’re Rocking The Boat led by Nic Bishop with the entire cast was wonderful. This show is a credit to the commitment of all those involved and will get better and better each night as the cast hit their straps, and can really drop into their characters, in every dance routine, song and scene. A joy for musical theatre lovers. 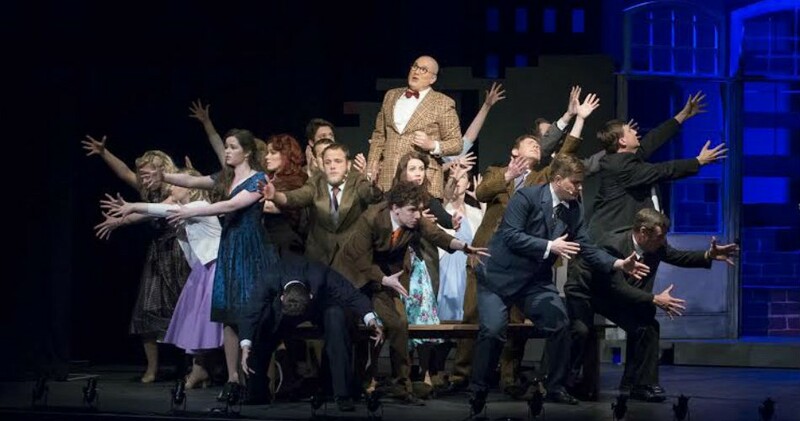 Nikki Fort Guys And Dolls continues at Arts Theatre, at various times, until Sat 10 Oct. Book at gandssa.com.au. Click HERE to purchase your tickets.